VIEW AT YOUR LEISURE IN OUR HEATED SHOWROOM..... # PLEASE NOTE # THE BMW HAS A FAULT WHERE THE REAR END FEELS LIKE ITS 'STUTTERING', HAVING LOOKED ON THE NET IT IS A COMMON FAULT, THE CAR STILL DRIVES & CAN BE DRIVEN WITHOUT BEING REPAIRED IF YOU CAN LIVE WITH THE OCCASIONAL 'STUTTER' BUT THAT IS THE PURCHASERS DECISION, WE HAVE PRICED THE CAR TO CLEAR AT TRADE VALUE & WILL BE SOLD AS 'SPARES OR REPAIRS & WITHOUT ANY WARRANTY'. WE HAVE HAD THE CAR MOT'D. 56 REG BMW X3 2.0D SE 6 SPEED 4X4 TURBO DIESEL FINISHED IN METALLIC SILVER WITH GREY UPHOLSTERY & FITTED WITH BMW SIDE STEPS, NEW CLUTCH & FLYWHEEL COSTING £500 FITTED LAST YEAR..... 8 SERVICE STAMPS..... ONLY 102000 WARRANTED MILES (AVE 8500 WARRANTED MILES). NEW MOT UNTIL 07/02/20. 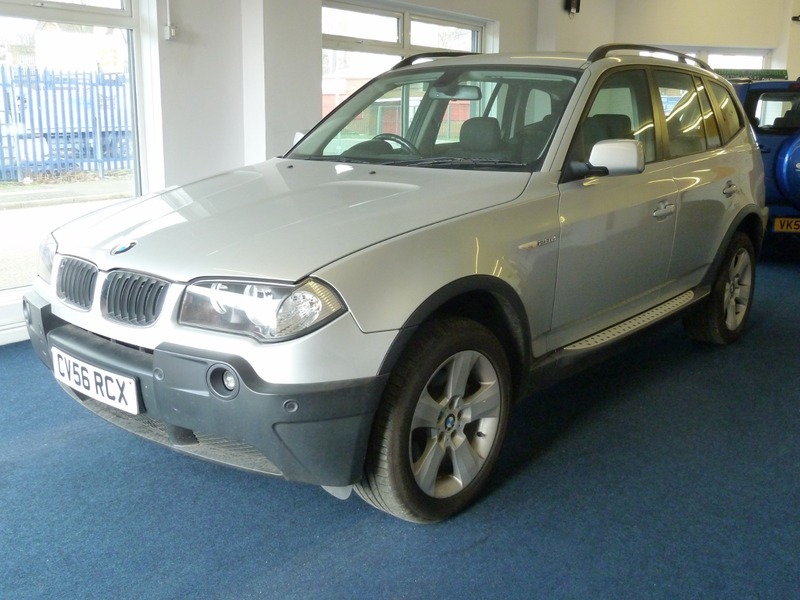 SERVICED BY BMW MAIN DEALER AT: PDI, 19918, 40732 & 58609 MILES. For Further Information Please Contact Us On 01384 429630 Or 07825 137260. Free 12 Months AA Breakdown Cover. Any Trial Or Inspection Welcome. Viewing By Appointment. Please Call For More Details. Open 7 Days Til Late. Part Exchange Welcome, Please Contact To Agree Value. All Vehicles Are HPI Checked. All Major Credit & Debit Cards. We Are Located 5 Minutes From The Merry Hill Shopping Centre At Cradley Heath, West Midlands, B64 7AA. 10 Minutes From Junction 2,3 & 4 Of The M5. We Can Tax Your Car Ready For Collection If Required. Please Check Our Customer Reviews And Buy With Confidence, We Have Been Selling Cars For Over 20 Years & Customer Satisfaction Is Paramount. We Can Arrange Pick Up From Cradley Heath Train Station Which Is A 20 Minute Journey From Moor Street Station, Birmingham. Delivery Can Be Arranged, Please Enquire For Price.